My US patents 7780416 & 8702393 windmills the energy it generates is tens of times more than the present windmill for a windmill which costs tenth the cost of the present windmill. Therefore this windmill is 100 times more efficient than the present windmill. The blinking sail windmill generates so much electricity due to its large size let’s say the 20 meters by 20 meters that the owner will get his money back in 142 days and that will never happen in any windmill even when they dream of one, the owner of the blinking sail windmill will get his money back in 142 days when he use it to generate electricity or make distilled water in desert countries or when making hydrogen from water to use it in cares instead of using petrol. Below the links to windmill prototype, plus the animations. I have contacted so many companies to buy my invention and all of them are manufacturers companies, but no response, I thought a lot I could not find the reason but I started to look in their sites I found that all of them had a malti-billion dollar contracts to make giant windmills for large wind farms, and since my invention is a totally different design therefore they ignore it because they have to scrap all their factories which make the fines some of them 130 meter long plus scraping the factories which make the giant posts and their 170 meter sky high electric generator. Since they have to scrape their factories and that will cost them billions of dollars and they will lose their contracts and that make them lose billions of dollars, plus they have to make new factories for my new windmill and this will cost them millions and millions of dollars. Therefore contacting the buyers of the windmills that is the wind farms owners who sell electricity to the people is more useful because those owners would love to have the best to their wind farms they will like to have a cheaper windmill and more efficient windmill and low cost maintenance windmill. My windmill has all these three properties it cost 10% only of the cost of the present windmill and this low cost BLINKING SAIL WINDMILL generates ten time more electricity than the present windmill therefore it is 10 x 10 = 100 times more efficient than the present windmill, in view of the cost. Besides that it has much less maintenance cost since the generator is not 170 meters above the ground like the present windmill because the blinking sail windmill generator is few meters above the ground. This windmill does not need a proto type to prove its magical capability since the sails which move boats and ships is the proto type for this invention. This windmill has one of the sales blocking the wind all the time. Therefore it generates power. While all the other sails letting the wind to pass through freely without any obstruction, so as if they do not exist. The result is one sail like in the ship generating power capable of moving a big electrical generator or a big water pump. The sail boats race which takes place every year where the boats travel around the world and all the power is supplied to these boats for this very long trip comes from a peace of cloth its price equivalent to some gallons of petrol. If changed to an engine boat it will need tons and tons of petrol to complete the journey around the world besides the spare parts and the initial high cost. When you watch these boats you can really see them moving at a high speed and cutting through the water with real force and big power and all of this is coming from a peace of cloth practically worth's nothing. If we make the electrical generator of the Blinking Sail Windmill having multi coil so when the wind is week only one coil activated then when the wind gets faster the second coil is activated so we get more electrical power and if the wind gets stronger the third coil activated and so on. when the wind gets much stronger the spiral spring of the horizontal bars starts to act so the horizontal bars start to swing to the other side, so even the active sail ( the sail which is blocking the wind) starts to let some of the wind to pass through the active sail so the wind do not damage the sail and as the wind gets stronger the gap gets bigger, therefore all the time the Blinking Sail Windmill is safe and generates electricity at the strongest winds besides generating electricity at the weakest wind near to stand still speed. 800 x %50 = 400 square meters. The blade length is 20 meters therefore it rotates in a circle its radius is 20 meters. 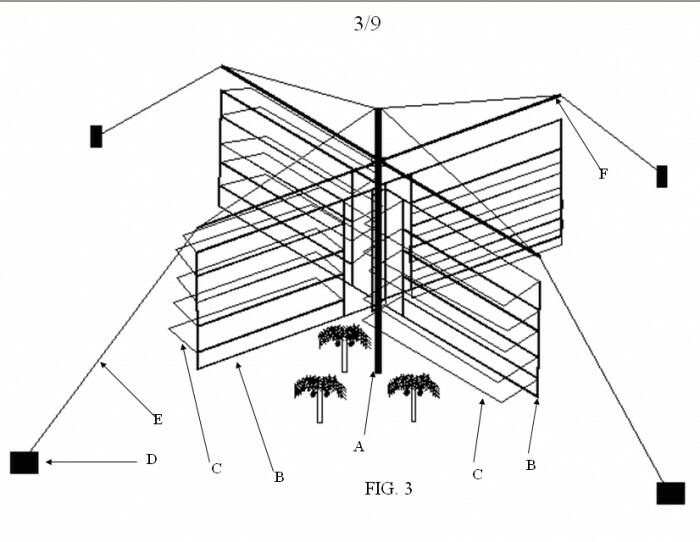 So the Three blades windmill has surface area of 2513 square meters of which only 60 square meters are active. The blinking sail windmill efficiency in surface area wise is %50. Therefore the blinking sail windmill is more efficient than the Three blades windmill in active surface area wise by 20.9 times. The blinking sail windmill is more efficient than the Three blades windmill in active surface area wise by %50 / %4.78= 10.5 times. 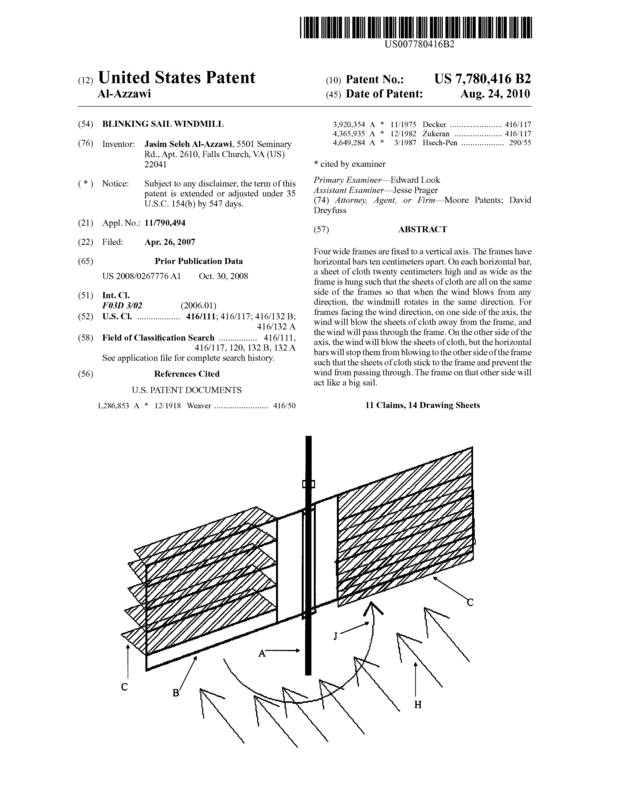 Page created at 2019-04-22 14:11:42, Patent Auction Time.